Aurelio del Pino, president of Aces, the association of supermarket chains such as Carrefour, Eroski, Lidl Supercor or says in this line that "the data already published and forecasts that we confirm our claim that any increase in VAT would been disastrous for consumption." It's something you notice the trade, but also the major manufacturers. "The recovery we have had in the first few months has been very weak," says Ignacio Larracoetxea president Promarca, an association that encompasses most of the brands leading food, beverage, household and healthcare. And the sector is not the only well that is alerting the break. Last week, the Bank of Spain and warned that the latest information regarding the third quarter shows a "somewhat less expansive behavior of private demand" and domestic consumption, as recorded in his newsletter this September. In the case of household consumption, says survey indicators of households and retailers were in the average July and August at a lower level than the second quarter. To try to curb this stagnant consumption, or falling in recent months, large retail chains have not hesitated to continue lowering prices, even if it had to reduce their margins and also lower their figures fracturing. On September 5, Dow Jones Business News reported Spanish Prices Firmly In Negative Territory, Deflation Beckons. INE, as the statistics institute is known, said Spain's consumer price index fell by 0.5% on the year in August, the biggest percentage decline since the country experienced a dip in prices in October last year. In July, prices had dropped by 0.3% after a few months of small increases. Spain's European Union-harmonized consumer-price index, which is a slightly different measure than Spain's own, was also down 0.5%. That compares with a 0.4% decrease in July. 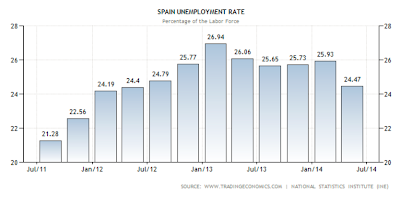 Spain emerged from more than two years of recession last summer, and is currently growing at one of the fastest rates in the eurozone--0.6% between March and June, and 1.2% over a 12-month period. It's safe to say Spain's growth has slowed if retail sales slowed. A September 25th report shows Illegal Activities Boost Spain's GDP by $11 Bln. Spain's National Statistics Institute says money generated by drug trafficking, prostitution, smuggling and illegal gambling contributed some 9 billion euros ($11.4 billion) to the national economy last year. The institute said Thursday that the country's gross domestic product is 26.2 billion euros larger — at 1.05 trillion euros — when estimates for illegal economic activities as well as money spent on investigation and research and military armament are included. Illegal activities represented 0.9 percent of total economic activity. So Spain GDP is up 1.2% and 0.9% of that growth is due to an accounting change that allows counting drugs, prostitution, and illegal activities as part of GDP. Back in April, I noted Public Debt Threatens to Exceed 100% of GDP in 2014. And take a peek at headlines for Spain Misses budget Deficit Targets. On the whole, there has not been much of a recovery, and what recovery there was, now appears to be over.